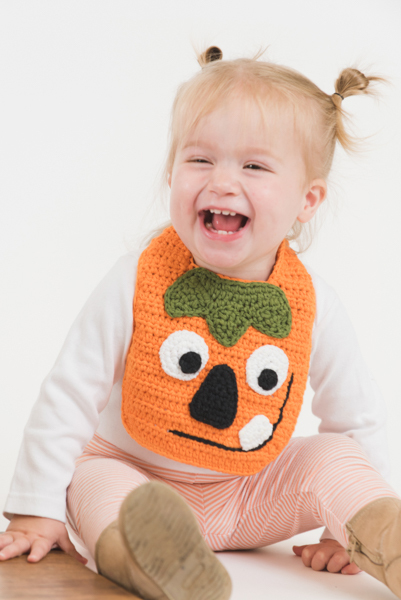 Meal time equals play time for most little ones, so deck out your little pumpkin in this adorable jack-o’-lantern bib. 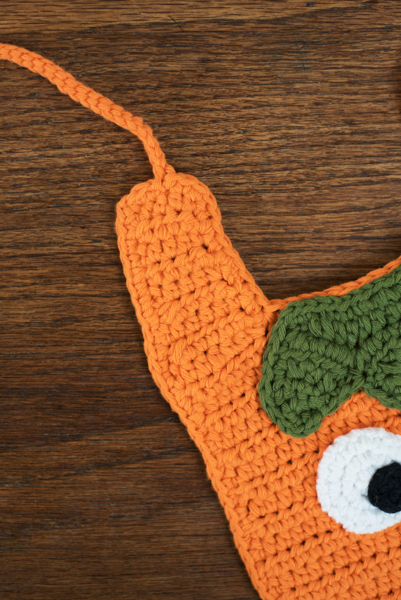 It’s easy to crochet and just right for celebrating Halloween. Yarn: Garnstudio Drops Paris (100% Cotton; 82 yards [75 meters]/50 grams): 13 Orange (A), 2 balls; 43 Green (B), 1 ball; 16 White (C), 1 ball; 15 Black (D), 1 ball. Row 1 (RS): Hdc in 2nd ch from hook and in each ch across to end of row, turn – 24 sts. Row 2: Ch 1, 2 hdc in same st as beg ch, hdc in each st across until last st, 2 hdc in last st, turn – 26 sts. Rows 3-4: Rep Row 2 – 30 sts. Row 5: Ch 1, hdc in same st as beg ch and in each st across to end of row – 30 sts. Rows 6-18: Rep Row 5. Row 19 (RS): Ch 1, hdc in same st as beg ch and in the next 6 sts, sc in the next st, turn – 8 sts. Row 20: Ch 1, sc in same st as beg ch and hdc in the next 7 sts, turn – 8 sts. Row 21: Ch 1, hdc2tog in same st as beg ch and in the next st, hdc in the next 5 sts, sc in the next st, turn – 7 sts. Row 22: Ch 1, sc in same st as beg ch and hdc in the next 6 sts, turn – 7 sts. Row 23: Ch 1, hdc2tog in same st as beg ch and in the next st, hdc in the next 4 sts, sc in the next st, turn – 6 sts. Row 24: Ch 1, sc in same st as beg ch and hdc in the next 5 sts, turn – 6 sts. Row 25: Ch 1, hdc2tog in same st as beg ch and in the next st, hdc in the next 3 sts, sc in the next st, turn – 5 sts. Row 26: Ch 1, sc in same st as beg ch and hdc in the next 4 sts, turn – 5 sts. Row 27: Ch 1, hdc in same st as beg ch and in the next 3 sts, sc in the next st – 5 sts. Row 28: Rep Row 26. Fasten off and weave in ends. Mark the middle st (3 st) with a stitch marker. Row 29 (RS): Reattach yarn on the other side of the Bib. Rows 30-39: Rep Rows 19-28, do not fasten off. Sc evenly around all edges, work sc3tog in each indented corner and 3 sc to help you turn a corner. When you reach either the stitch marker, ch 46, then sl st in the 2nd ch from the hook and in each st along until end, sl st back onto Bib in the same st as beg ch 46 to join, then continue to sc around the edges. Row 1: Hdc in 2nd ch from hook and in each ch across to end of row, turn – 12 sts. Row 2: Ch 1, 2 hdc in same st as beg ch, hdc in the next 3 sts, turn – 5 sts. Row 3: Ch 1, hdc2tog in same st as beg ch and in the next st, hdc in the next st, hdc2tog in the remaining sts, turn – 3 sts. Row 4: Ch 1, sc in same st as beg ch and in the each st to end, turn – 3 sts. Row 5: Sk first st, sc2tog remaining sts, fasten off and weave in ends – 1 st.
Reattach yarn in next empty st of Row 1. Rows 6-9: Rep Rows 2-5. Rows 10-13: Rep Rows 2-5, do not fasten off. Sc evenly around all edges, work sc3tog in each indented corner and 3 sc to help you turn a corner. With C, either make a magic ring (adjustable ring) to start or ch 2. Rnd 1: Work 6 sc into the ring or 2nd ch from hook, use tail yarn to tighten centre ring closed if necessary – 6 sts. Rnd 2: Work *2 sc in each st; rep from * to end of rnd – 12 sts. Rnd 3: Work *sc in next st, 2 sc in next st; rep from * to end of rnd – 18 sts. With D, either make a magic ring (adjustable ring) to start or ch 2. Row 1: Sc in 2nd ch from hook and in each ch across to end of row, turn – 5 sts. Row 2: Sk first st, sc in each of remaining sts – 4 sts. Rows 3-5: Sk first st, sc in each of remaining sts – 1 st.
Sc evenly around all edges, working 3 sc in the corners. Rows 2-3: Ch 1, sc in same st as beg ch and in the each st to end, turn – 5 sts. Note: Seam the piece using the same yarn you made each item of the project with (e.g. with A for eyes). If your yarn is plied, split the plies apart by half and use that to sew with for a neater finish. Sew Green Pumpkin Top to the top of the Bib with Row 1 of the Pumpkin Top corresponding with the gap of Row 18 of the Lowe Bib. Sew Inner Eyes to Outer Eyes, using photos as a guide, and attach them to the Bib (over Rows 8 and 10). The right eye should be 1” from the right side of the bib and 1½” away from the left eye. The left eye should be roughly 1” from the left side of the bib. Sew the nose on in between the eyes roughly 1½” from the bottom of the bib. 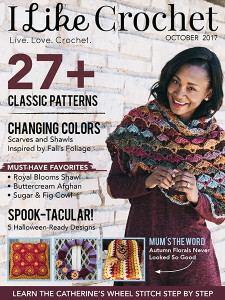 With D, either embroider or surface crochet a smile onto the pumpkin between Rows 2 and 3 of the Lower Bib, and working your way up (on the left-hand side of the face) to Row 11. Thanks so much for this pattern, it’s so cute and can be adapted to make so many things! I love his face!